Counting Down the Days until…Hanukkah! I have been missing in action and I do apologize. 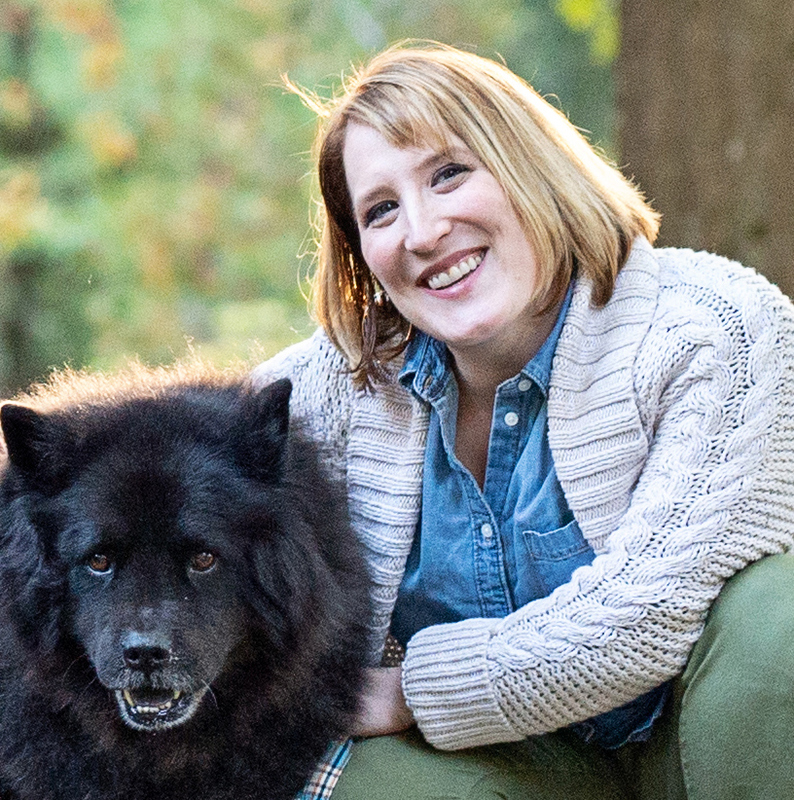 Things have been insanely busy and that has meant blogging and crafting have had to take a backseat. But with Thanksgiving almost here, it’s time to start thinking about Hanukkah. Some of you have emailed to ask if I’d be doing the yearly printable countdown calendar so of course I had to oblige. Without Thanksgivukkah to spur on this year’s calendar design, I joined the Frozen-craze still going strong in my son’s world and made this year’s calendar a bit frosty, complete with star of David snowflakes. My son started kindergarten this year, and I think it’s partly the age and partly the fact he is no longer at a Jewish school, but I have been fielding repeated questions about Santa and whether we’d also celebrate Christmas. I’ve explained that while some people do celebrate both, we celebrate Hanukkah but that we can also celebrate winter as well. So, I think this year’s countdown calendar embraces that idea while staying true to Hanukkah. 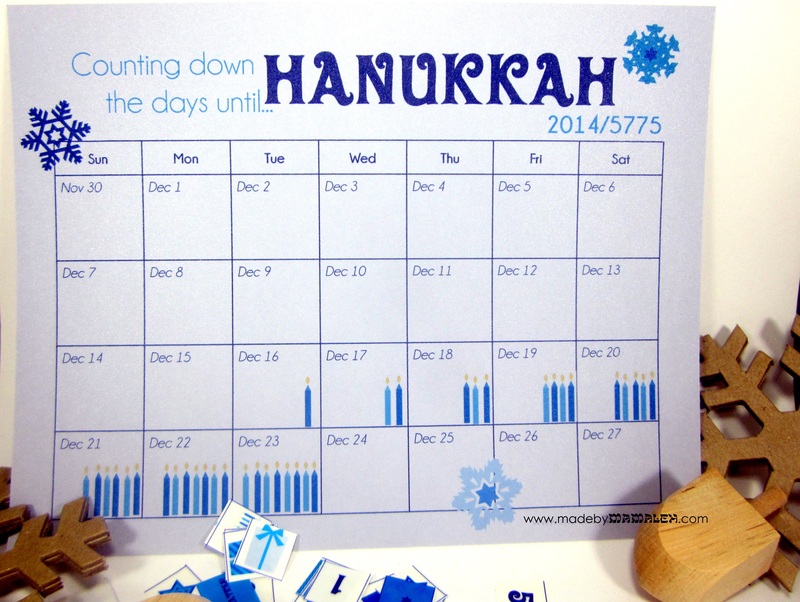 Once again using Microsoft Publisher and some fun graphics from Maree Truelove on etsy as well as snowflakes from another etsy shop, here is this year’s Countdown to Hanukkah Calendar for your printing pleasure! For 2014, I opted to print mine on some shimmery blue paper to go with the snowy theme and printed the stickers on clear inkjet labels so the candles will show through the numbers. But as I mentioned last year, you could also print the “stickers” on paper and just use tape or glue. You could also just use whatever stickers you might already have on hand. Hope you have as much fun counting down the days as we do! Stay tuned for more Hanukkah fun coming soon! 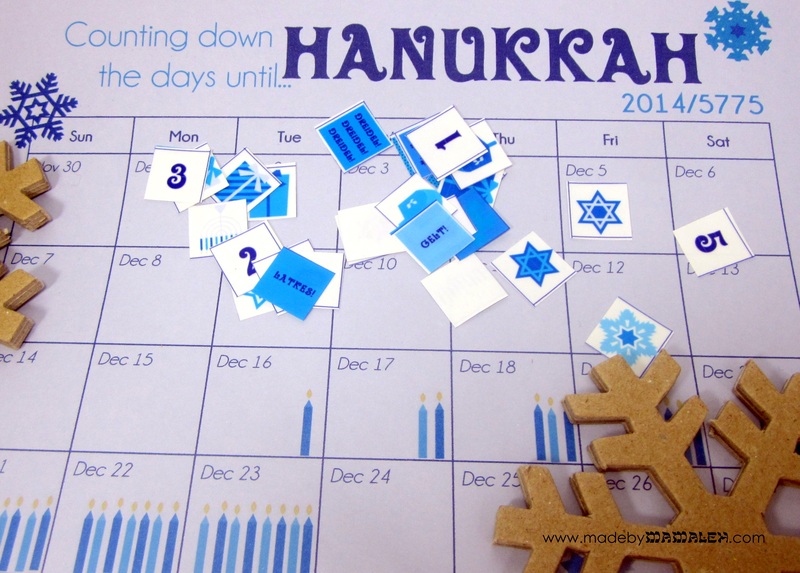 This entry was posted in Hanukkah, Kids, Printables and tagged Hanukkah, kids, Printables. Bookmark the permalink. Made by Mamaleh is where the crafty and the Jewish combine to give you fresh, chic, creative ideas from a Jewish perspective. Night 2: Unicorn sprinkle matzo roca and of course mini jelly slices. Hope your seders were as sweet as ours!